I wonder who did this to my best make-up? I don’t own a lot of make-up, I don’t wear a lot (just enough to try and disguise my perpetual lack of sleep) and I’m certainly not very expert at applying it. However, all three of my girls are obsessed by it. 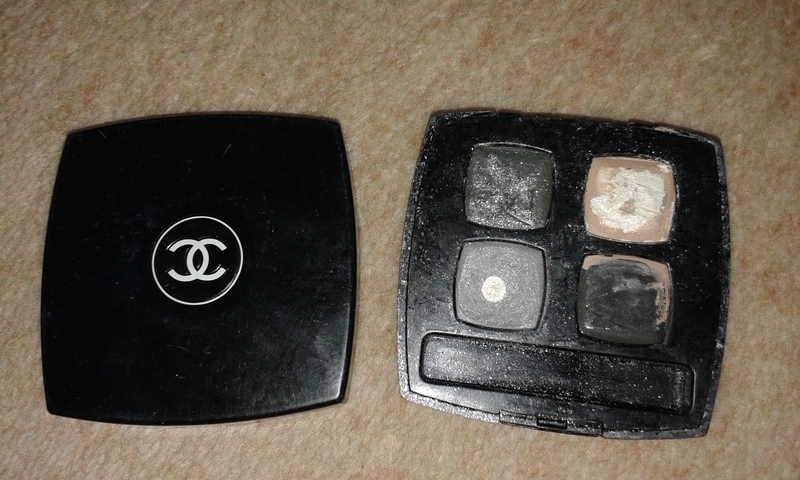 They are constantly rummaging around in my make-up bag and always asking if they can put make-up on me… err, no! My eldest daughter (aged six) has a Christmas/birthday list that has about five different named make-up sets on it. She already has quite a bit of the stuff already (I have never bought her any myself) and last weekend spent loads of her own money trying to win a nail polish set on the tombola at her sisters’ pre-school Christmas fayre. Her four-year-old twin sisters don’t own any, but use their big sister’s; sometimes with permission, but usually without. I certainly don’t make a big thing of putting on make-up and my whole routine takes less than five minutes, so where has the obsession come from? Should I be worried that they’ve all taken to preening themselves in front of the mirror and that the younger two are always banging on about wanting to wear ‘beautiful dresses’? Well yesterday I received a press release, which simultaneously reassured and alarmed me. The headline: Two in Three British Mothers Allow Daughters Under 8 to Have Professional Beauty Treatments. This reassured me that their behaviour is probably pretty harmless comparatively-speaking, but professional beauty treatments for the under 8’s, really? I think I was in my early twenties before I had my first professional manicure, let alone anything else. The release, based on research from The British Association of Beauty Therapists and Cosmetologists (BABTAC), went on to say that a third stated that their child underwent professional beauty services (such as professional hair removal, manicures and facials) ‘regularly’. Apparently three-quarters of those who did let their daughters have treatments said that they improved their child’s confidence levels. How very sad. So where do I draw the line? Currently my eldest is allowed lip gloss and nail varnish for parties (she dabbles with eye shadow, but I don’t let her leave the house with it on) and the twins are allowed just nail varnish for parties. What I’m struggling with is where experimenting, being a bit creative and having fun crosses into more worrying territory; a territory where girls are completely obsessed about their appearance and are actually using make-up and demanding beauty treatments to feel better about themselves. I must admit they do seem a bit young to be interested in make-up but if they use it as part of “playing” then hopefully it won’t become too serious too quickly. As you say , Sofia is not allowed to wear eye make-up when going out so she has some limits set already. I was desperate to own a pair of sparkly high heeled plastic shoes when I was 9 but my Mum flatly refused to let me have them for the obvious reason that I might twist my ankle. I might have been miffed at the time, and I remember it well, but stick to your guns Fran with your rules on make-up and they might outgrow the obsession. P.S I have some new rollers for them to use in their hair when here!!! i know what you mean. Molly loves makeup. We went to toys r us the other day to get ideas for xmas. I asked her what she wanted and she said “every single lip balm in the world” I don’t let her wear any make up apart from lip balm or a bit of kids lips gloss., sometimes nail varnish. It’s trying to find a balance of creative play and teaching them that other things like being a good person etc are more important. I watched a little of programme called “secret lives of 5 year olds” and there was a little girl who wore full eye make up and lipstick and liked to talk to other kids about who they fancied. When the other kids starting playing and being silly she could not join in as I don’t think she knew how to. Very sad. I’m sure you are doing a great job Fran! It is really difficult. They are all naturally drawn to it and it’s not something I’ve encouraged. In a sense, I don’t want to stamp on something they enjoy as it’s not like they are doing any real harm. However, I don’t want to get to a stage where they obsess about their appearance. I’m not into make-up now, but I do remember a picture of me – probably aged 3 – with a girls’ vanity set and red lipstick smeared all over my face. Probably is a phase. Now OH is suggesting a Nintendo for Sofia for Christmas. She’d love it, but I think she’s a bit too young. So many dilemmas!!! I worried as well when my 7yr old developed a fascination for makeup at about aged 3. I stopped worrying quite quickly as left to her own devises she will cover her face with blue and purple and glitter, because she loves the pretty colours. And ‘it looks fab, mummy! !’ It’s an extension of dress up. So like you I set limits of when it’s OK to play and, it’s never ok to play with my expensive stuff! For going out she is allowed tinted lip balm, but I suggest that purple blusher may be a bit much! Even more reassuring was when I had my son, he shows the same fascination at 18 months. It’s all just curiousity and exploration and fun. Saying that, I dont have regular treatments so I wouldn’t be promoting that to her anyway! You’re right, I think it is an extension of dressing up. M&G literally raid the dressing up box every day and obviously I don’t have a problem with that. It is experimentation and I suppose it’s like everything else, children try to push the boundaries and we try to rein it back in. The whole beauty treatments thing would really worry me though! !